Is co-op available in your program? Many UVic programs offer optional co-op - this means you need to apply to take part. Other programs are rolled into your academic program. Biochemistry and Microbiology Co-op is an optional co-op program. Application deadline: September 16 (early entry for upper-year students) and September 30 (second year of study). Later entry also possible; please contact your co-op office. For a list of specific sample co-op jobs, please contact your co-op office. At the end of each work term, you must complete a work term report and a 15-minute oral presentation. Biology Co-op is an optional co-op program. 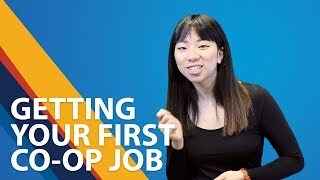 As a co-op student, you must complete a preparation course called Introduction to Professional Practice before you start your first co-op work term. You'll take this course in addition to your regular courseload and it consists of six - 50 minute sessions. At the end of each work term, you must complete a work term report and an oral presentation. Work term report guidelines (pdf) – You'll create a scientific report on a subject you choose with your employer. Oral presentation guidelines (pdf) – You'll give an eight-minute presentation to your peers. Chemistry Co-op is an optional co-op program. Eligibility for admission is determined based on the following criteria and a personal interview, which takes into account your academics and history. If you're not sure whether you meet these criteria, please contact the co-op coordinator at scicoop@uvic.ca. International students (student visa holders) are eligible to participate in the co-op program. Students are eligible to apply to the co-op program after they have completed a minimum of 1 year of classes at UVic, or have an equivalent of transfer credit from another institution. All graduate students, both domestic and international, are eligible to participate with the consent of their academic supervisor. If you have any questions, please email Arkady Futerman at scicoop@uvic.ca. Applications are assessed on a rolling basis. Summer applications: Response time during the months of July and August can be lengthy due to the work load of the co-op office. 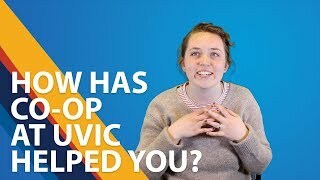 If you have submitted an application and have not heard anything after 2 weeks, please emails scico@uvic.ca to inquire about your appliation status. September applications: Applications submitted in September will be assessed within 3 business days. As a co-op student, you must complete a preparation course called Introduction to Professional Practice (IPP) before you start your first co-op work term. You'll take this course in addition to your regular course load. The course consists of six 50 minute sessions. Download the schedule for the Fall 2018 IPP. Note that students must sign up for and attend only one offering of each session. Formulation and analytical chemist – EcoSafe Natural Products Inc. Process operator – Teck Ltd.
Analytical chemistry student – PBR Laboratories Inc.
Work term report guidelines (pdf) – You'll write a 3,000-word scientific report on a subject you choose in consultation with your supervisor. Oral presentation guidelines (pdf) – You'll give a 7–10 minute presentation to other students and faculty members. Earth and Ocean Sciences (EOS) Co-op is an optional co-op program. Upstream environmental operation, water team – Husky Energy Inc.
Coastal naturalist – Calliope Consulting Inc.
Geologist co-op student – Teck Ltd.
What kinds of co-op jobs are available? Connect with your co-op coordinator to arrange funding for a job specific to your area of research. If you’re already working closely with a faculty member or industry partner on a joint endeavor that’s contributing to your graduate research project, you may be able to count this as co-op work term. This arrangement would be at the discretion of your school or department through consultation with your co-op coordinator and graduate adviser. Note: The links on this page work best in Firefox or Safari. If you are using Internet Explorer and receive a 404 message, please try an alternate browser. Optional co-op program—select co-op when applying for Kinesiology. Minimum B average (GPA 5.0) required. Apply by January 31 of first year. A final online competency assessment – complete this assignment at least one week prior to completing your work term. A work term report– A 10- to 15-page reflective report about your work term. A final online LIM competency assessment – complete this assignment at least one week prior to completing your work term. Discuss your assessment with your supervisor. A poster – The poster presentation session is normally scheduled for the first week of classes in the term after your co-op. See next section for details. If you are completing a third or fourth work term, you may choose to complete an alternative assignment instead of a poster. All RHEd and Kinesiology co-op students must create a poster for each work term (see poster instructions). Poster presentations are held during the first week of classes of the term immediately following your co-op work term. You’ll leave your poster with EPHE Co-op after your session, so don’t include any photos that you want returned. What should posters look like? Read the poster instructions for digital samples or see this sample. You can view students' past work term reports to learn what it's like to work for a certain employer or in a particular type of co-op job—from other co-op students who've already experienced it! Search past students' work term reports. Many students entering the field of Recreation & Health Education are admitted into the RHED program having had a range of work experiences. Completing a work term challenge is a means to honor this work experience and help you complete your degree in a timely way. If you have had relevant work experience, you may propose work term challenge in lieu of one of your required work terms. Learn how to request a Work Term Challenge (RHED only). Once approved, you'll need to complete a reflective paper outlining the learning you've experienced. View the Work Term Challenge Report Sample and see the Work Term Challenge Guidelines for details. Many EPHE co-op jobs require or recommend specific certifications. See certifications and training for information about how to earn these. Health Information Science Co-op is a mandatory co-op program. This is a mandatory co-op program - you're automatically enrolled as a Health Information Science student. It's an undergraduate-level program and three co-op work terms are required. Your co-op office will provide you with information about your work term report and oral presentation. Graduate students – Please contact the co-op office for admission requiremements. During the work term, you'll complete competency assessments at the start, middle and end of your experience. You'll also have a work site visit. At the end of each work term, you must complete a work term report. HUFA students may choose from several options; please see work term report options (pdf) for details. The UVic Law Co-op Program is the only comprehensive common-law program of its kind in Canada. The legal profession is broad and diverse, and Law Co-op provides an excellent opportunity for law students to explore career options. Law Co-op admits 50 first-year law students by lottery in the fall of each year. To include your name in the lottery, please contact us. Five additional spaces are available through a special access category for students who face socio-economic barriers to completing law school and/or entering the legal profession. We maintain a waitlist of interested students; students on the waitlist will typically be offered a space eventually. Law co-op students are required to complete two work terms. See Law Co-op and the J.D Program (pdf) for more information and to see how Law Co-op will affect your schedule. Some students go on to article with their previous co-op employers after law school. 1. Describe the work term setting and summarize the activities/projects undertaken on the work term. Comment on outcomes of your activities. 2. Summarize your competency growth and development throughout the work term, linking this to your academic background, law school courses, and previous work experience. 3. Comment on the extent to which the Faculty of Law prepared you for this work term. 4. Append a sample work product (5-10 pages). Provide a summary of the process you followed to complete the work product, any challenges you faced, and competency growth and development attained through completing this work product. Mathematics and Statistics Co-op is an optional co-op program. Investment operations intern—BC Investment Management Corp.
Physics and Astronomy Co-op is an optional co-op program. Da Vinci surgical system software/data intern – Intuitive Surgical Inc.
Master of Public Administration (MPA) students are automatically enrolled in co-op. Note on back-to-back work terms: Students are permitted to take back-to-back co-op terms (upon approval from the co-op coordinator) after your second co-op term. You may not take back-to-back co-op terms after your first co-op term. You may opt to continue with your current co-op employer for your back-to back co-op term, but we encourage you to diversify your experiences. Many MPA and MADR students secure placements in the public sector at the federal, provincial, or local government level, including agencies and commissions. Co-op opportunities are not limited to the Victoria area—you're encouraged to take placements throughout BC, elsewhere in Canada or abroad. As such, we recommend that you do not commit yourself to a rental leaseso that you are prepared to leave Victoria for co-op opportunities. Submit your work term term report by the deadline. This report outlines your work and learning from the co-op term. Sign up for your oral presentation. In some terms, students have an opportunity to share their learning with the School of Public Administration community. Attend a debriefing session with your coordinator. Tell your co-op office when you plan to go on your next work term. Update your address on MyPage. After each co-op term, you'll take part in a work term presentation session. These sessions are open to all public administration students and faculty members. The sessions help the school and the co-op program evaluate our programming. Your co-op office will provide you with information and a schedule for these sessions. Application requirements vary depending on your level of study and your program area. Anthropology– Overall GPA 5.0. Average GPA 5.0 in all ANTH courses. Economics – Overall GPA 4.5. GPA 4.5 in Econ 103 or 103C or 180, 104, 225, and Econ 245(no less than B- in each). No less than B in one of CSC 105, 110 or 111. If you have taken ECON 203 or 204, you must meet the GPA 4.5 requirement in these rather than ECON 103 or 103C or 180 and/or 104. Geography – Overall GPA 5.5. GPA 5.5 in all GEOG courses. Political Science – Overall GPA 5.0. GPA 5.0 in 100- and 200-level POLI courses. Must complete POLI 351 before second work term. Psychology – Overall GPA 5.0. Average GPA 6.0 (B+) in all PSYC courses. Restoration of Natural Systems - Overall GPA 5.0; completion of RNS core courses. Sociology – Overall GPA 5.0; GPA 5.0 in SOCI 100, 210 and 211. Once admitted you are required to attend the Introduction to Professional Practice seminars: four workshops plus a mock interview. These seminars begin the week following the application deadline each term. All Social Sciences graduate students are eligible for co-op. You can apply in September or January after you have started your program and before you are finished your final project (e.g., thesis, major project, or dissertation). Speak to your supervisor about your plans. Keep in mind that as a graduate student, you must complete your first co-op term before you are finished your final project. Please contact your co-op office for details. Unofficial UVic transcripts (i.e., administrative transcript from My Page). If have transferred from another school and this is your first term at UVic, then provide your unofficial transcript(s) from your previous institution(s) (not high school). Once admitted you are required to attend the Introduction to Professional Practice seminars: four workshops plus a mock interview. Please check the Fall 2018 seminar schedule. Indicate in Section III on your application form which seminar you will attend. You can work part time while taking courses: Parallel (part-time) co-op depends on employer and student needs. You can complete two or three work terms consecutively with the same organization (some students and employers appreciate longer placements) or with different organizations. *Typically, students in the Social Sciences are admitted to co-op (not the work experience program). If you join co-op, you can choose to complete fewer co-op work terms than the required number, but will not receive the co-op designation when you graduate. Social Sciences students are technically skilled (numbers, technology) as well as interested in community, social, and environmental involvement (communication and collaboration skills). Our students engage in diverse interests and work environments—environmental, industrial and corporate, public sector policy, private equity and banking, data management, social services and community development. Mid-term meeting (aka site visit): you will meet with a Co-op coordinator (in person, over the phone, or on Skype) and your supervisor to discuss your work and learning. Work Term Submission: Depending on your program, these assignments have different formats, including written reflective reports, oral presentations and an online discussion forum. Your submission is due on the first day of classes following each work term. If you’re graduating in November, your submission is due August 15. If you're graduating in June, your work term submission is due April 15. Psychology co-op students take part in an online forum during their work term and do a presentation of their experiences following their work term. Submit your work term report as a .doc or pdf file to sscoop@uvic.ca. 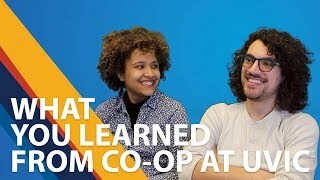 WHAT IS CO-OP? Learn about co-op including how it works and what's expected of you (including completing the Introduction to Professional Practice class), plus check out fees and salaries.